Natural beaches, lush jungles and a taste of rural Mexico draw people to the picturesque fishing village of Sayulita. Located on the Pacific coast of Nayarit, Mexico, this pueblo was originally a hacienda for harvesting small coconuts for oil. These brown golf-ball sized nuts are still found on the jungle paths, along with mangos, large coconuts, papaya, and citrus fruit. Dogs, chickens, and kids run and play in the dirt roads. Visitors and locals enjoy baseball games, festivals with live music, surfing, bicycling and kayaking. Make sure to visit the Official Sayulita Website for up-to-date information regarding the village and local area. Sayulita is a world away from nearby Puerto Vallarta and its huge resorts, discos, and parasailing. In fact, many say Sayulita is what Puerto Vallarta was 40 years ago. Sayulita's slow pace makes it hard to leave --evidenced by the number of northerners building winter homes. 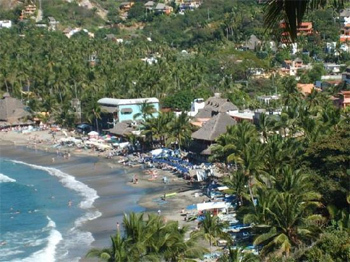 The local government recently passed an ordinance prohibiting the cutting of all trees to help prevent Sayulita from becoming another Vallarta. Sayulita is known for its rare black and white sand beaches. You could visit a different beach every day of the week-by foot, bike, kayak, horse or car. A short two-block walk from the square is the town's main beach. Small wooden fishing boats accent the long swoosh-shaped beach. Many people enjoy walking or jogging the beach that takes about 30 minutes walking. People watchers and seafood lovers flock to El Costeño, Sayulita's oldest eating establishment. In addition to the restaurant's affordable menu, local divers often come here to sell their just-caught oysters. This open-air palapa with a sand floor is steps from the water where waves attract surfers and boogie boarders. The calmer water in front of Don Pedro's restaurant is very swimmable with a gradual slope and sandy bottom. North past Papas Palapas is where the river runs into the ocean. Egrets and other birds often feed here while horses and cows graze the riverbed. This isn't a good place to swim due to the river's polluted water. The sand gets softer as you reach Playa Questos in front of the village's two camping parks. The rough waves welcome surfers and brave swimmers. Surrounded by rocky cliffs, this tiny horseshoe-shaped beach is perfect for lovers. Carefully watch the ocean so you don't get washed when the tide comes in. Access is by a treacherous rocky path through the brush or through the rock arches on the south side of Playa Malpasos. To find it, walk inland along the arroyo after Sayulita's main beach ends and get on the jungle road until you see another arroyo after the barbed wire fences end. From town, you can also reach Playas Cuevas and Malpasos by walking along Calle M. Navarrete until it turns into the jungle road. Playa Malpasos is free of rocks and surrounded by palm trees. Unfortunately, Vallarta Adventures started bringing groups of tourists here daily. Come in the early morning or evening to enjoy solitude. Don't swim here, there is a dangerous undertow. For real exercise, continue walking to the neighboring village of San Francisco AKA San Pancho four miles from Sayulita. One end of the beach is very swimmable and the other end is home to Costa Azul Adventure Resort, a nice place to have a drink and watch the sunset. In the middle lie the quiet cobblestone streets of San Pancho. After Playa Malpasos, you'll pass the former estate of Mexico's former president. Here you might have to practice a bit of citizen's action because the new owners have blocked access, which is against Mexican law. People still cross by ignoring the "no trespassing" signs. If you're up for some risky rock climbing, it's possible to scale the rocks over the ocean at low tide. Hopefully, by the time you arrive, this situation will no longer be an issue. San Pancho is accessible by Highway 200. In the other direction from Sayulita is Playa de Los Muertos, which is very popular with Mexican families and a safe swimming beach. Huge rocks protect it on both sides. Walk around the curved bay past Villa Amor and head up the hill through the cemetery. When you hit a small river walk along it to the ocean. Las Cargadas is the tiny beach past the rocks to the south. There are other little beaches here that are best accessed by kayak. Here, you'll find huge waves and it's very possible that you'll be alone on this wild, windswept beach. There are homes here but most are well hidden in the wooded hill about the water. Taking the one-lane dirt road through the jungle is the best way to get here. Starting at the cemetery, it's your second right turn. Through town, follow Niños Heroes until it enters the jungle and make the first left turn. This is an uphill 40-minute walk. Near Gringo Hill, these beaches are an hour walk or 10-minute drive from town. Continue out of town on Revolucion past the cantina onto the road to Punta de Mita (Camino Punta Mita). Make a right at the first road and continue straight on it. The adventurous can also climb the rocks past Carrizitos. In addition to hiking to the beaches, explore the hilly countryside by foot. Since tourist development gravitates towards the beaches, you'll see more authentic Mexican living as you head inland. Dirt roads and a lack of traffic make the area very walkable. Sayulita is a great place to start as a beginner and draws advanced surfers as well. Lessons are given by all the local outfitters below. Playa de Los Muertos and the main beach in front of Don Pedros are the best areas for swimming. Ask at El Costeño for a local fisherman who'll take you out on a boat to fish for snapper, mahi-mahi, manta rays and small sharks. Horses are rented at Villa Amor and by Don Pancho who lives a block past the town square on Ave. Revolucion across from the hardware store. The jungle roads make for great off-road riding. In fact, most cycling will feel like off-road. For longer rides, try the road to Punta de Mita. You can go as far as the village of Higuera Blanca about a two-hour ride or all the way to Punta Mita (about three times farther). One of the easiest ways to find Sayulita's more secluded beaches is by kayak. From the main beach, it is easy to kayak to around the rocky point to Playa de Los Muertos and beyond to Las Cargadas. If you want to do a day-long trip, continue around the next point to Carrizitos. Short lessons are always provided before you go out on the water. Papas Palapas on the beach rents kayaks and surfboards by the hour and day. Prices start at $9 an hour. Santa Crucesita on Revolucion rents surfboards, boogie boards, bicycles and wetsuits by the hour and day. Antonio Rodriguez sells aquatic equipment from his store on Delfines between Alas Blancas and El Costeño. Day trips to Islas Mariettas, an island bird sanctuary off Punta De Mita, are offered here. Sunday is baseball day. You may catch Sayulita playing a team from a neighboring town or a game for older players. The stands have as much action as the field with raffles for money and cases of beer. Winners usually share their beer with other fans and everyone is good friends by the end of the game. The area was home to the native Cora and Huichol people. Ancient ceramics have been unearthed here along the Nayarit coast. The best place to learn about local history is by visiting the museums of Tepic, Nayarit's capital city. Tia Adrienne's Bed and Breakfast hosts regular shows of Huichol art and culture. Ask her about trips to Huichol villages. Three times a winter, Sayulita hosts two-day-long surfing competitions. The couple's surfing is especially entertaining and often comical. Spending the night in Sayulita can cost you less than $4 or more than $400. Lodging includes hotels, camping, villas and season-long rentals. Sayulita's trailer park is right on the beach and fills up quickly during the winter. Spaces rent for $15 a night with electricity, hot showers, and a recreation room. After entering Sayulita turn right at Calle Miramar, it ends at the park. The Camaron is next door with palapa, tent and trailer camping. For $3, you get hot showers and can camp anywhere on the lot plus you can borrow a bicycle or surfboard during your stay. Expect beach bonfires and drum circles at night. Hotel Diamante Internacional, on the corner across from the trailer park, has a swimming pool. Rooms and bungalows with kitchens start at $20. Bungalows Gaviotas, a block from the town center, has clean rooms with baths starting at around $18. Some rooms have kitchens in varying degrees of functionality. The longer you stay, the less they charge per night. Tia Adrienne's Bed and Breakfast, Sayulita's oldest and most popular place to stay less than a block from the beach on Calle Delfines and Manuel Navarrete. horseback riding tours, kayaks, and a restaurant. Aurinko Bungalows and Los Arbolitos (behind the paleteria). If you are looking to stay for a while or traveling in a group, there are tons of villa rentals, many which fall into the luxury category. Villa Olivia is a 3-5 bedroom villa on a private beach with maid service and a swimming pool, 10-minute drive from Sayulita. Costs range $2,250-$4,900 per week with discounts for 2 weeks or more. Tel: 011-52-327-50185. Two taco stands are open at night, one in the main plaza and the other near the bridge. On the plaza, you can find sandwiches (tortas), BBQ chicken and ice cream. Restaurants on the plaza include Calypso, Choco Banana, Seafood Tiger and Cafe Laura. A block toward the beach, on M. Navarrete is Alas Blancas and Breakers. For seaside dining in order of increasing expense, there's El Costeño, Barbaros and Don Pedros. Seafood pizza cooked in a clay oven is available Thursday through Saturday at Pizza Ron on the river. On the other side of the sports field on Calle Miramar, you'll find Cocina Economica next to Cafecito. Of several grocery stores throughout the pueblo, Mi Tiendita on the square is the largest and best priced. If you're buying food for the week, go to Vallarta for better variety and prices. On Avenue Revolucion, there are special stores that just sell tortillas, chicken and meat. For fresh fish, go to the beach in the morning and wait for the fishermen to return. Sayulita is not a big party town, only a couple establishments stay open past midnight. The latest is Calypso, a bar/restaurant overlooking the town square that caters to tourists. Here you can listen to jazz and reggae music while watching surfing videos. Don Pedros, also a restaurant/bar, has live reggae music and dancing during tourist season. Check here regarding salsa dance lessons and yoga classes. On Saturdays, there is dance or "baile" in the basketball court. Sometimes they play disco and other times local banda groups play. It's very popular with locals. Cafecito features acoustic music Thurs.-Sat. in a classy garden atmosphere. The pool hall upstairs kitty-corner from Calypso is a hangout for Mexican men. In recent years, patrons have become tolerant of female tourists using the hall. Unfortunately, it closes around 9 pm. Fiesta del Pueblo is always Feb. 24 with festivities throughout that week. Vendors and carnival rides and games fill the streets. Cars and buses have to find an alternate route. A rodeo and multi-band concert are the highlights. Semana Santa (Holy week) translates to Spring Break for city dwellers from Guadalajara who flock to Sayulita. There are no cultural traditions happening in the streets like in some Latin American towns. Discos and parties happen every night. Dia de al Marina is Mexico's equivalent of Memorial Day. In Sayulita, instead of honoring dead soldiers, the people honor fishermen who never returned. Boats are filled with ice and beer, a huge meal is cooked and people celebrate all day. At night, everyone goes out on boats and forms a ring to pray and throw flowers in the sea. When they return, the festivities continue. Mexican Independence on Sept. 16. For two days, the village celebrates with traditional dances, dramatic re-enactments of Mexico's history including pre-Colombian rituals, bands, food and dancing in the town square. There is a special dance of the village elders and a greased pole with prizes on top that the men attempt to climb for hours. The successful pole climber throws the gifts out to the crowd. Festivities culminate with the Gritar de Independecia where everyone shouts "Viva Mexico" at the top of their lungs. Tourism makes the area inexpensive to fly to and accessible by bus from the US. Sayulita is less than an hour north of Puerto Vallarta by bus or car. Follow Highway 200 north from the airport, cross into the state of Nayarit. The road passes Mezcales, Bucerias, San Quintin, and finally San Ignacio before reaching the 3 km turnoff to Sayulita. America West, Mexicana, Alaska, Canada 3000, AeroMexico fly into Diáz Ordaz Intl. Airport of Puerto Vallarta. Suntrips and SunQuest offer packages to Puerto Vallarta you can purchase airfare only. From the US Border, it is 28+ hours by Transportes Norte de Sonora or Pacifico to the Tepic Terminal. Here you can take Pacifico to Sayulita. Pacifico won't let you off at the highway crossing after dark if you are female. Pacifico also offers local bus service between the village square and Puerto Vallarta from 6 am to 8 pm. Choco Banana posts the current schedule. Car rental is available at the airport from all major companies. Daily rates without insurance start at about $25 for a compact. If you carry Mastercard or Visa, you probably already carry insurance that covers car rental in Mexico. Taxis from the airport start at $30. Collectivo taxis run regularly from Sayulita to San Pancho and La Peñita. The weather in Sayulita is generally a bit milder than in Puerto Vallarta. November through February is the coolest, driest period with temperatures around 75-80 degrees F. Nights are usually cool enough to need a sweater and jeans. It gets hotter and more humid in April and May. The rain/storm season is June-October. During this time, the waves get very big and the beaches nearly disappear. Advanced surfers love it. Come prepared for mosquitoes. There aren't tons, but they seem to like tourists. If you need medicine or advice, visit the pharmacy, which is run by a doctor. There is a hospital in neighboring San Francisco for emergencies. The closest ATM is in Bucerias. For a bank--including changing foreign currency--you need to go to Mezcales, Puerto Vallarta or La Penita. The liquor store and Paleteria will change your money for slightly higher rates. Public telephones are located in the Paleteria. Rates to the US are almost $2 a minute. A cybercafe is located in the front of the plaza facing the church. Hourly rates are about $4 and hour. US citizens can use a birth certificate and drivers license or passport to enter Mexico. For visa costs and length of stay, consult the Mexican Embassy or consulate.